Many dental patients want to know what the differences between x-rays and a cone beam images are. They perform very similar functions – exposing the inner parts of the tooth and the tooth roots. 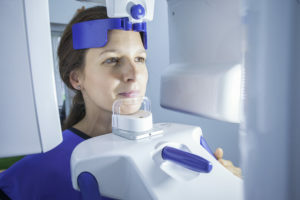 However, 3D cone beam scans offer dentists a more complex view of the inner workings of your smile, including the teeth, jawbone, and other oral and facial structures. Digital x-rays themselves are an important clinical innovation in both the dental and medical fields. They have allowed doctors to clearly see internal bodily structures and more easily diagnose and accurately treat patients. The images captured by digital x-ray scans are two dimensional. To get an idea of what this means, imagine you sliced an apple in half. Looking at the flat part of the slice, you might see a brown spot. Without cutting further into the apple, you won’t be able to tell how deep the brown spot goes. This is what x-rays give us. A flat view of the inner structures of teeth. While we’re able to see areas of decay or damage, it can be difficult to accurately estimate the full extent of the damage. That’s where 3D cone beam imaging comes in. Using a 3D cone beam scanner, we’re able to get a complete, 360-degree view of the smile. From fully assessing damage to one individual tooth to evaluating the way the teeth, jaws, and skull bone are interacting, 3D images allow us a much better understanding of issues and give us the ability to accurately plan for the most advanced treatment processes. This means we’re able to more effectively treat patients and more completely renew oral health. Tracking the development of a child’s oral and facial structures in order to intervene in the early stages, if we notice signs for concern. Planning for complex procedures like dental implant placement, orthodontic corrections, and root canal therapy to ensure safety and efficacy of these complex treatments. Watching the progress of the smile during orthodontic alignment to ensure teeth are shifting into their ideal position according to plan. At Smiley Family Dentistry, we are passionate about patient education. The more you know, the more confident you’ll feel about your dental care plan. That’s why we take the time to explain all your treatment options before beginning any dentistry plan. If you want to learn more about digital x-rays, explore other advanced dental technologies, or schedule an appointment, contact our friendly Waverly dental team to get started today. We look forward to seeing you and your family soon!